2. Musculocutaneous Nerve Supplies Lateral Side of Forearm Also. Important See the Diagram:- All muscles of thumb are supplied (pollicis) are supplied by Median Nerve except which causes adduction(Ulnar Nerve)..Obviously Ulnar nerve is a medial nerve it supplies the Adductor Pollicis as adduction is towards medial. 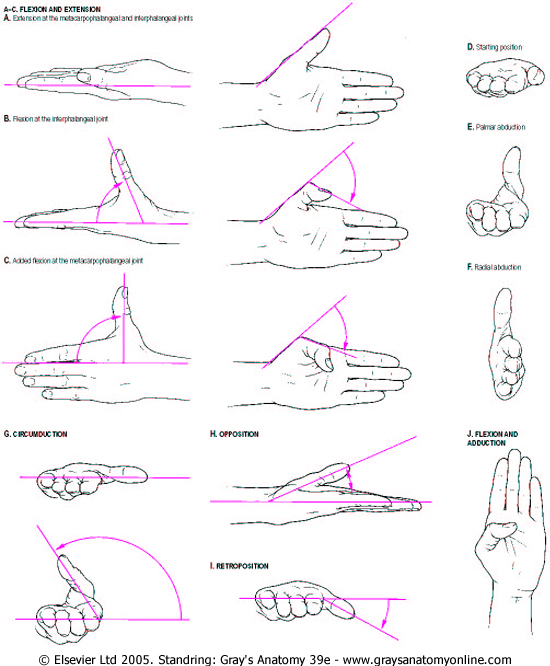 The median nerve is vulnerable to division from lacerations at the wrist. Division leads to paralysis of the lumbricals to the index and middle fingers and the thenar muscles (apart from adductor pollicis), as well as loss of sensation to the thumb, index, middle and radial half of the ring fingers. The radial half of the hand becomes flattened as a result of wasting of the thenar muscles and the adducted posture of the thumb. Rest all intrinsic muscles including all interossie are supplied by ULNAR NERVE. Flexor Pollicis Brevis Superficial head supplied by Median Nerve while deep head by Ulnar Nerve. Flexor Pollicis “Longus” supplied by Median Nerve. 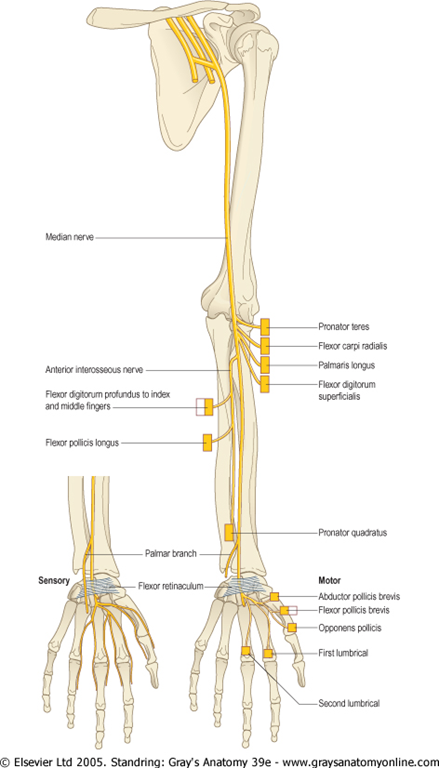 Pollicis “Longus” muscles are supplied by respective chief muscles of forearm like abductor pollicis longus by radial nerve and flexor pollicis longus by median nerve. ULNAR NERVE (Musician nerve)IS CHIEF MUSCLE OF HAND. 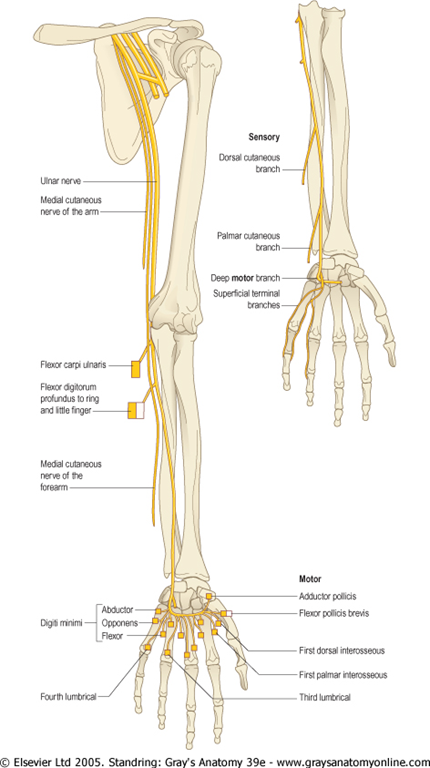 MEDIAN NERVE (Laborers nerve)IS CHIEF MUSCLE OF FRONT OF FOREARM. 4.Dorsum of middle finger is supplied by radial nerve and ulnar nerve and median nerve. Function of Deltoid:-Major abductor of arm (abducts arm beyond initial 15° done by supraspinatus); clavicular fibers (Anterior Fibers) assist in flexing the arm; posterior fibers assist in extending the arm. 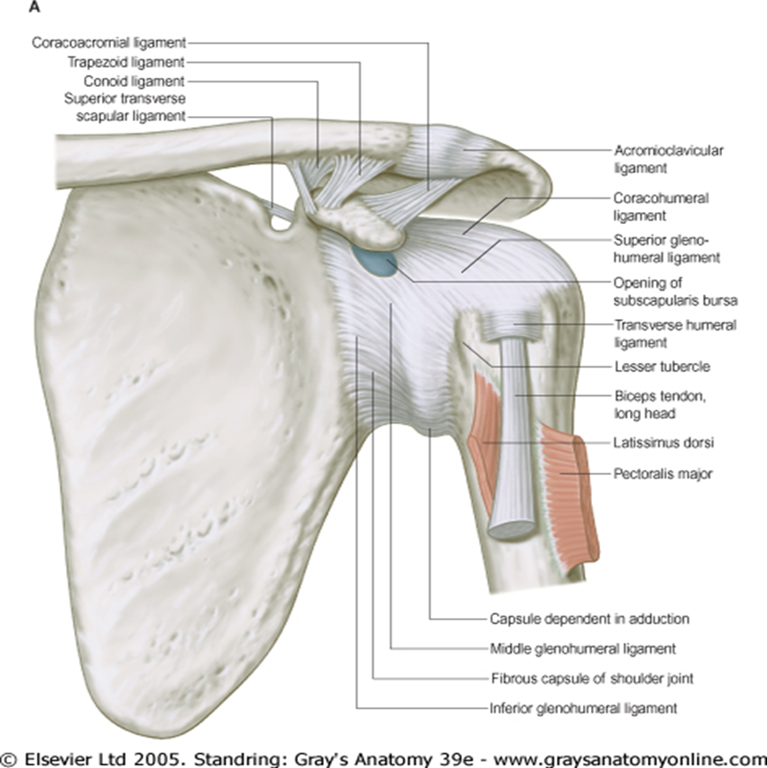 The Subacromial space is defined by the humeral head inferiorly, and the anterior edge and inferior surface of the anterior third of the acromion, coracoacromial ligament and acromioclavicular joint superiorly. 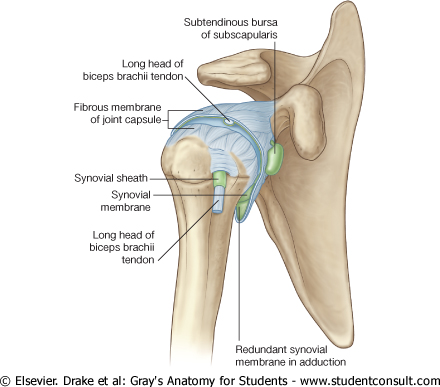 It is occupied by the supraspinatus tendon, subacromial bursa, tendon of the long head of biceps brachii, and the capsule of the shoulder joint. 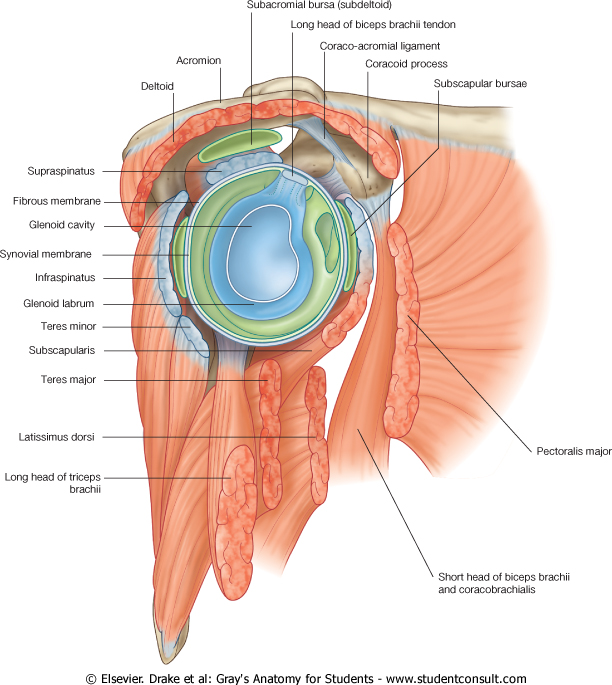 Rotator cuff impingement syndrome is a painful disorder caused by severe or chronic impingement of the rotator cuff tendons under the coracoacromial arch (Michiner et al 2003). 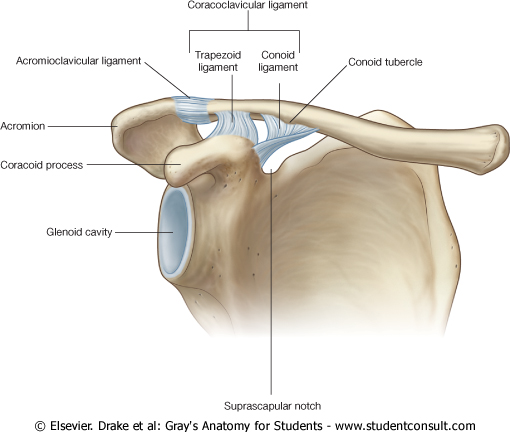 The cuff normally impinges against the coracoacromial arch when the humerus is abducted, flexed and internally rotated. This is known as the impingement position. The supraspinatus tendon is anatomically affected most by the impingement, which interestingly also coincides with an area of reduced vascularity in this tendon. 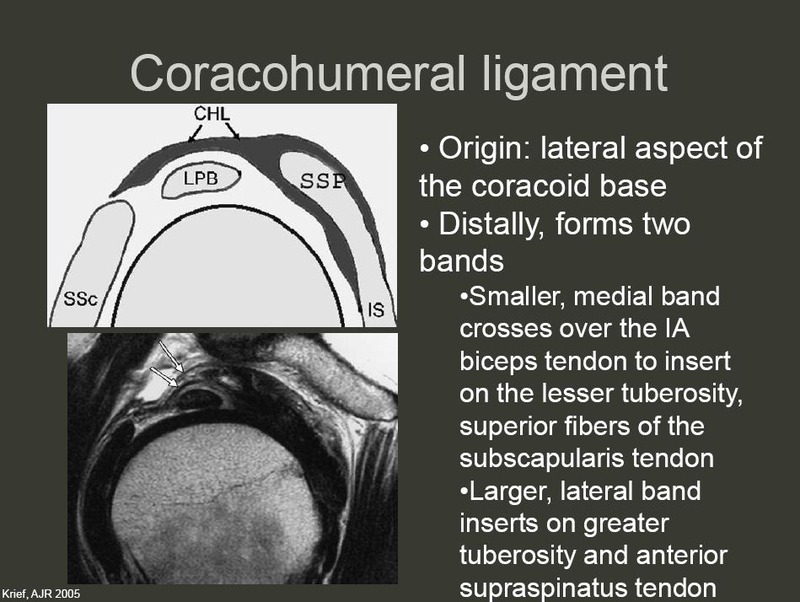 Severe impingement can be caused by osteoarthritic thickening of the coracoacromial arch; inflammation of the cuff from disorders such as rheumatoid arthritis; and prolonged overuse in the impingement position, e.g. in cleaning windows, which, when associated with a tendinopathy from age-related degenerative changes within the tendon, can lead to subsequent partial or complete tears of the cuff. 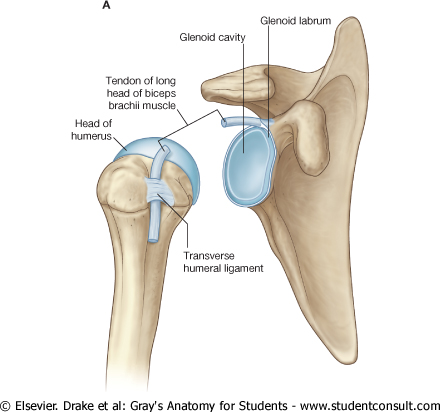 Clinically, this condition causes tenderness over the anterior portion of the acromion, and pain which typically occurs on abducting the shoulder between 60° and 120° (the painful arc). 7. 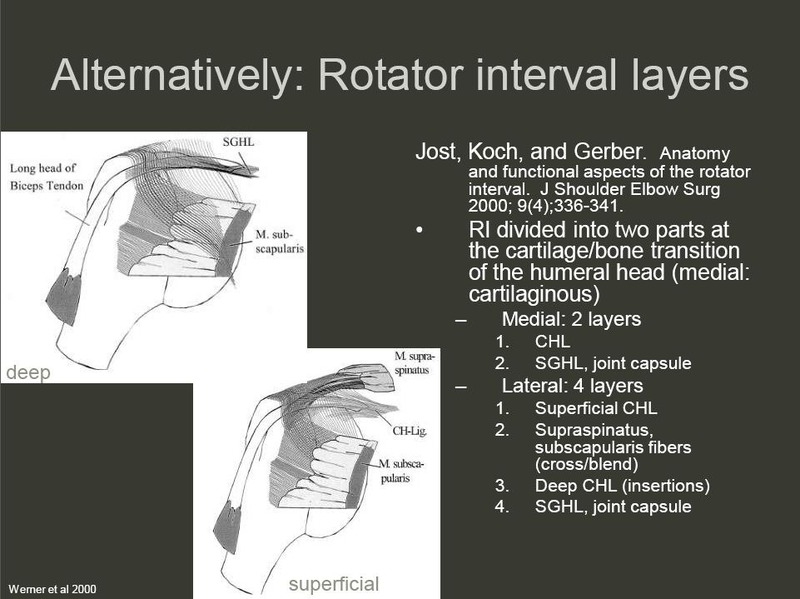 Rotator Interval in detail :-The rotator cuff interval is a triangular space between the subscapularis and supraspinatus tendons and the base of the coracoid process, covered by the rotator interval capsule, whose main component is the coracohumeral ligament (CHL). The rotator cuff interval is a triangular space created by the intervention of the coracoid process between the subscapularis and supraspinatus muscles and tendons. 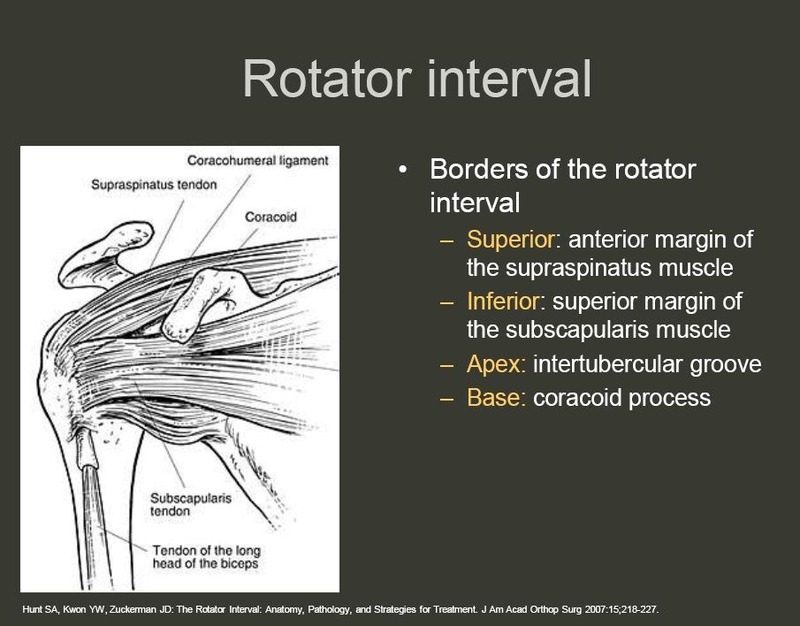 The floor of the rotator cuff interval is the cartilage of the humeral head, and the roof of the rotator cuff interval is the rotator interval capsule, which links the subscapularis and supraspinatus tendons and is composed of two layers: the CHL on the bursal side and the fasciculus obliquus on the articular side.The rotator interval is an anatomic region in the anterosuperior aspect of the glenohumeral joint that represents a complex interaction of the fibers of the coracohumeral ligament, the superior glenohumeral ligament, the glenohumeral joint capsule, and the supraspinatus and subscapularis tendons. As basic science and clinical studies continue to elucidate the precise role of the rotator interval, understanding of and therapeutic interventions for rotator interval pathology also continue to evolve. Lesions of the rotator interval may result in glenohumeral joint contractures, shoulder instability, or in lesions to the long head of the biceps tendon. Long-term clinical trials may clarify the results of current surgical interventions and further enhance understanding of the rotator interval. 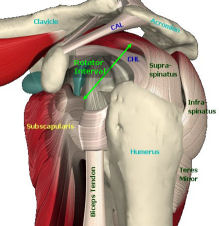 The rotator cuff interval is a triangular space between the subscapularis and supraspinatus tendons and the base of the coracoid process, covered by the rotator interval capsule, whose main component is the coracohumeral ligament (CHL). 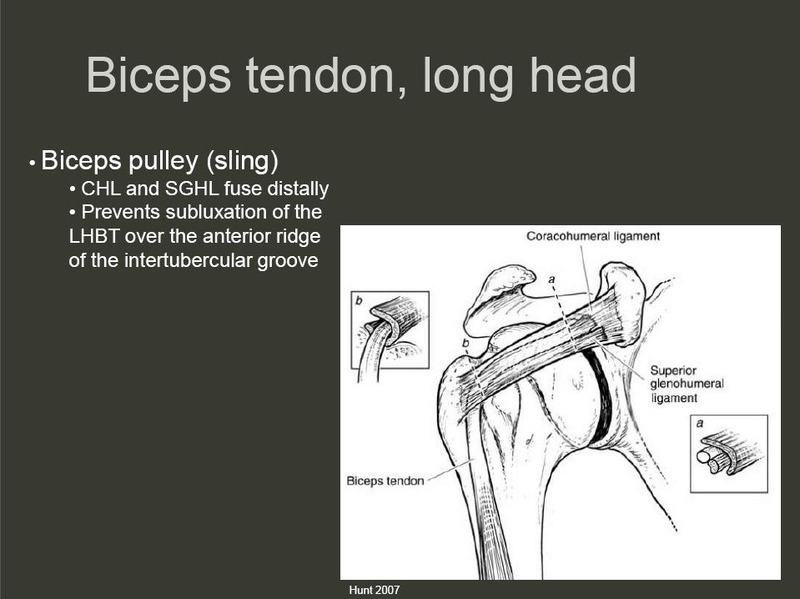 The rotator cuff interval contains the long head of the biceps tendon (LBT) and the superior glenohumeral ligament (SGHL) [1–6]. The relationships between the CHL, the SGHL, and the LBT are complex and may be difficult to analyze on MRI because of the variable appearance of the CHL. the lateral margin of the long head of triceps brachii. 9. Axillary nerve may be damaged by dislocation of shoulder or by the fracture neck of the humerus.Deltoid is paralyzed with loss of abduction at the shoulder.The rounded contour is lost leading to FLAT SHOULDER.There is sensory loss over lower half of the deltoid. Deep branch of Transverse cervical artery makes anastomosis with suprascapular artery and circumflex scapular artery.This is an anastomosis between first part of subclavian artery and third part of axillary artery. 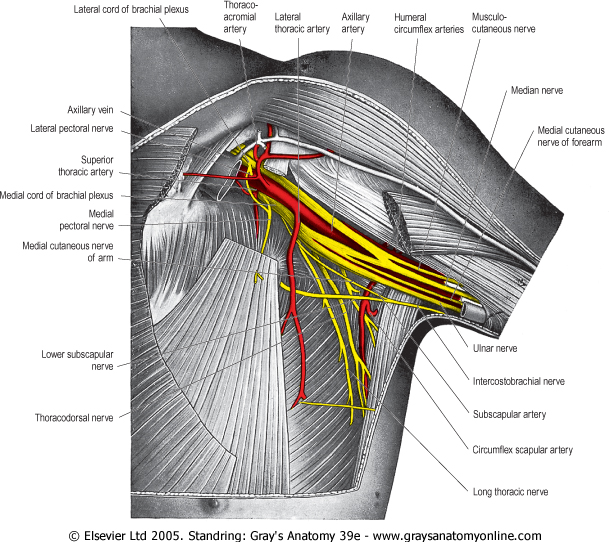 The thoraco-acromial artery is a short branch which arises from the second part of the axillary artery. The superior thoracic artery is a small vessel which arises from the first part of the axillary artery near the lower border of subclavius. 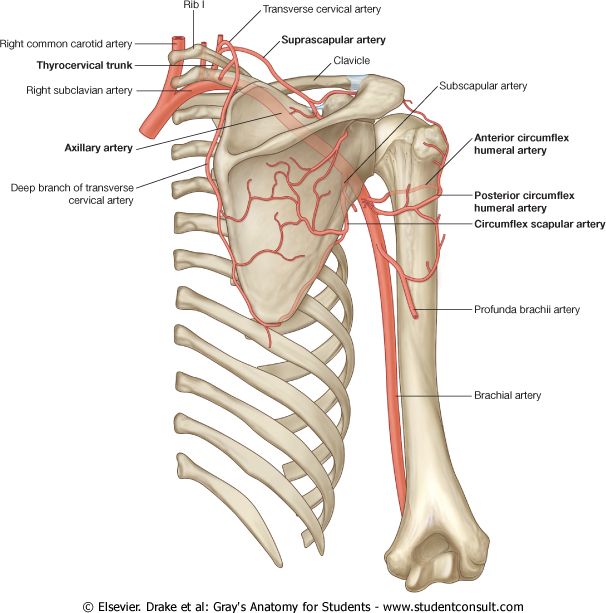 The subscapular artery is the largest branch of the axillary artery. It usually arises from the third part of the axillary artery at the distal (inferior) border of subscapularis, which it follows to the inferior scapular angle, where it anastomoses with the lateral thoracic and intercostal arteries and the deep branch of the transverse cervical artery. The other terminal branch of the subscapular artery, the thoracodorsal artery(DNB2010), follows the lateral margin of the scapula, posterior to the lateral thoracic artery, between latissimus dorsi and serratus anterior. Before entering the deep surface of latissimus dorsi, it supplies teres major and the intercostals and sends one or two branches to serratus anterior. It enters latissimus dorsi muscle with the thoracodorsal nerve: this constitutes the principle neurovascular pedicle to the muscle. It provides numerous musculocutaneous perforators which supply the skin over the superior part of latissimus dorsi. The intramuscular portion of the artery anastomoses with intercostal arteries and lumbar perforating arteries. 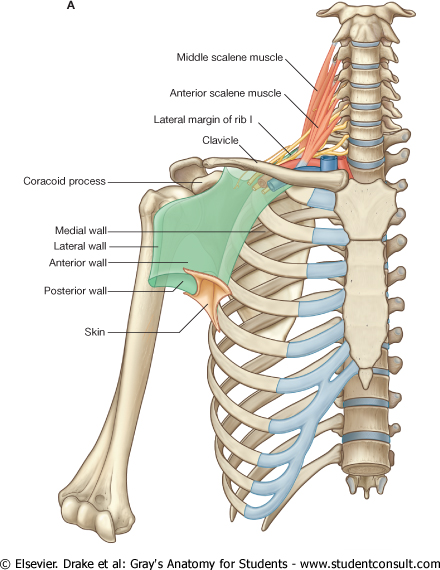 The main muscles producing flexion at shoulder are :- Pectoralis major clavicular head and Clavicular or anterior fibers of deltoid….IMP…Accesory muscle producing flexion at shoulder is Coracobrachialis supplied by Musculocutaneous nerve. Flexion at forearm is lost as it supplies brachialis as well as Biceps brachii. 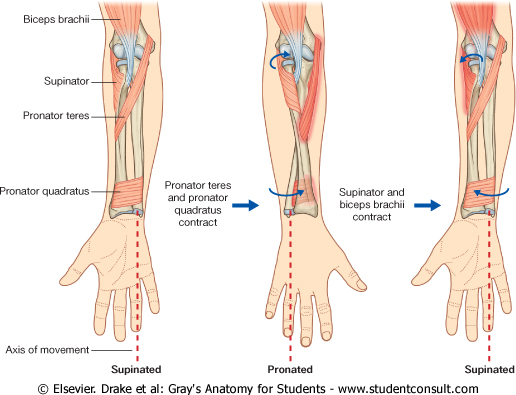 Supination is lost as Biceps brachii main action is supination when the forearm is flexed. (Supination is brought about by supinator and biceps brachii.Slow supination with elbow extended is done by supinator while rapid supination is done by biceps when arm is flexed against resistance. An interscalene brachial plexus block relies on dispersion of the larger volume of local anesthetic within the interscalene groove to accomplish blockade of the brachial plexus.Each trunk divides onto an anterior and a posterior division behind the clavicle, at the apex of the axilla. Within the axilla, the divisions combine to produce the three cords, which are named lateral, medial, and posterior, according to their relationships to the axillary artery. 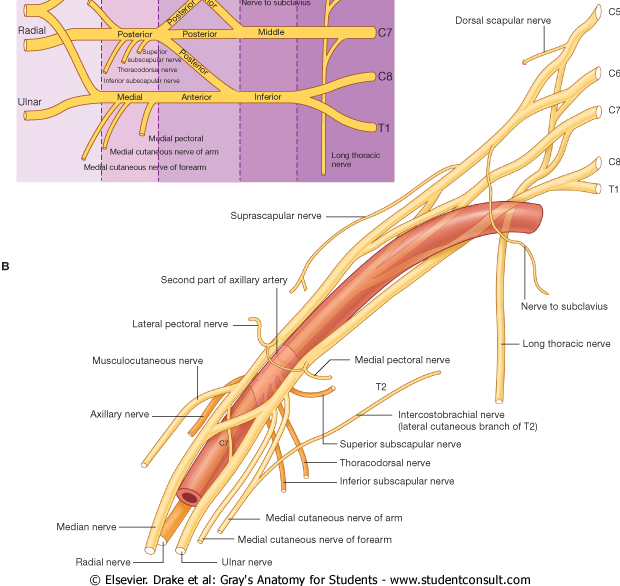 From there on, individual nerves are formed as these neuronal elements descend distally.The interscalene approach to brachial plexus blockade results in consistent anesthesia of the shoulder, arm, and elbow. The interscalene block is not recommended for hand surgery; more distal approaches to the brachial plexus should be used instead (e.g., infraclavicular, axillary). T2 area is not anesthetized. (intercostobrachial nerve area is proper answer.In the above choices Ulnar nerve is the closest to the root values. Anatomy:-Between the scalene muscles, these nerve roots unite to form three trunks, which emerge from the interscalene space to lie cephaloposterior to the subclavian artery as it courses along the upper surface of the first rib. Therefore, the “superior” (C5 and C6), “middle” (C7), and “inferior” (C8 and T1) trunks are arranged accordingly and are not in a strict horizontal formation, as often depicted. At the lateral edge of the first rib, each trunk forms anterior and posterior divisions that pass posterior to the midportion of the clavicle to enter the axilla. Within the axilla, these divisions form the lateral, posterior, and medial cords, named for their relationship with the second part of the axillary artery. 12. Ligament of Struther`s:-Struther, ligament of: fibrous band (occasionally ossified) running between medial epicondyle and shaft of the humerus. 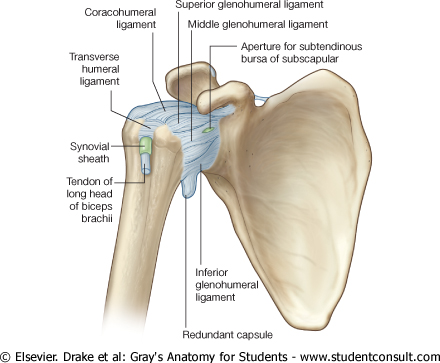 Struthers’ ligament is a ligament that extends between the shaft of the humerus and the medial epicondyle of the humerus.It is not a constant ligament and can be acquired or congenital. Its clinical significance arises form the fact that the median nerve, passes in the space between the ligament and the humerus, and in this space the nerve may be compressed leading to supracondylar process syndrome.The ligament is usually ignored and not mentioned due to the fact that its not always found. 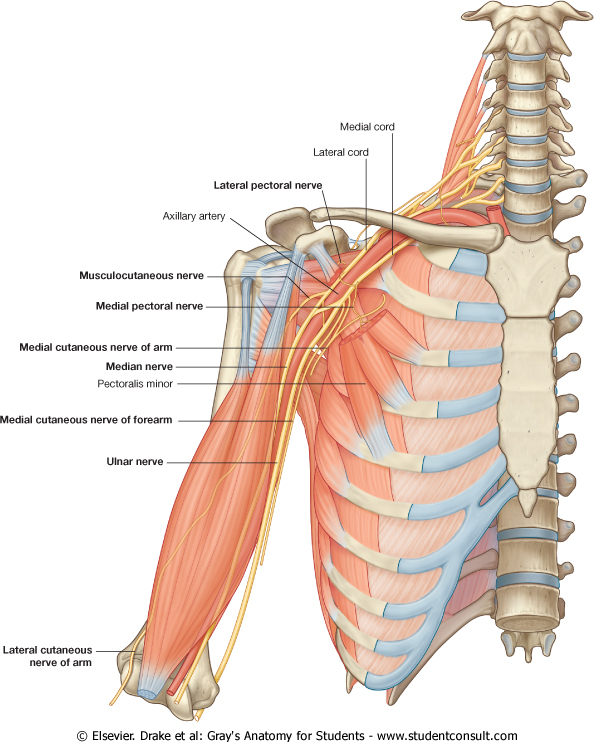 13.Musculocutaneous Nerve lies laterally to the Axillary Artery….IMPORTANT POINT. 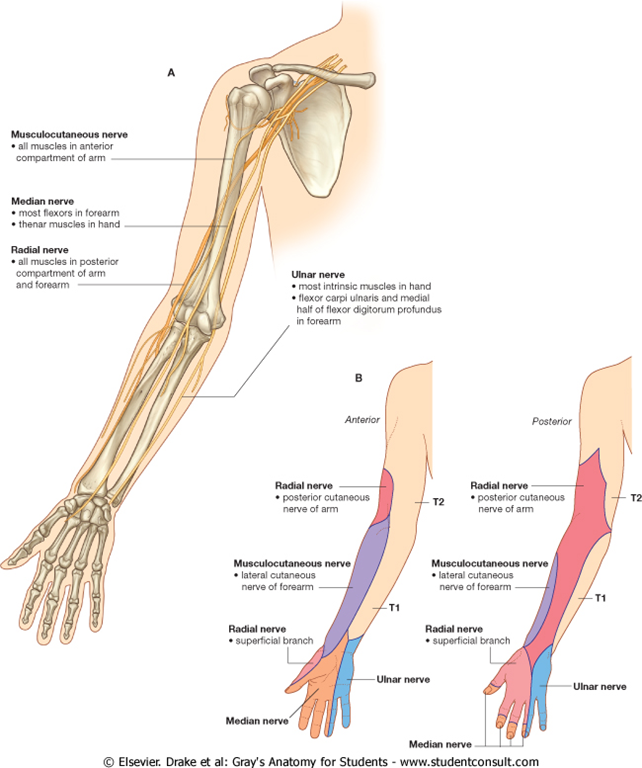 Musculocutaneous, median, and ulnar nerves in the arm. 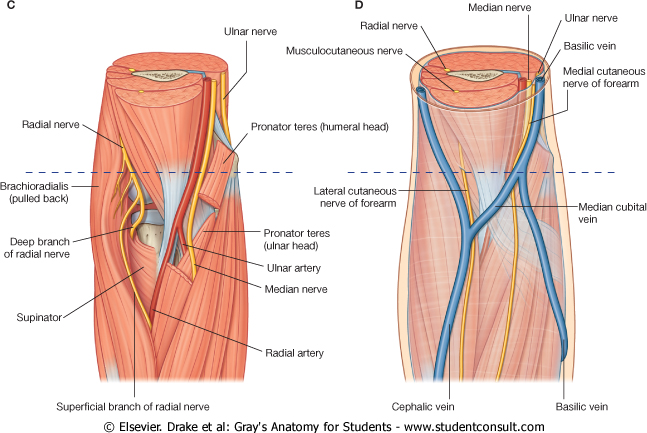 The ulnar nerve enters the arm with the median nerve and axillary artery (Fig. 7.67). 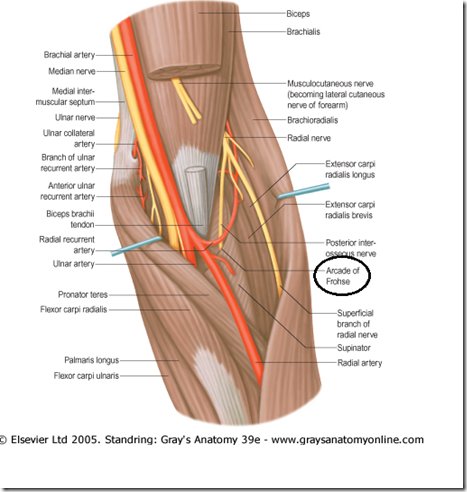 It passes through proximal regions medial to the axillary artery. 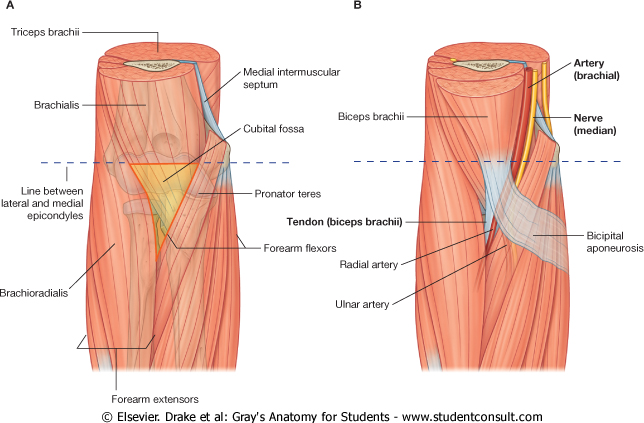 In the middle of the arm, the ulnar nerve penetrates the medial intermuscular septum and enters the posterior compartment where it lies anterior to the medial head of the triceps brachii muscle. 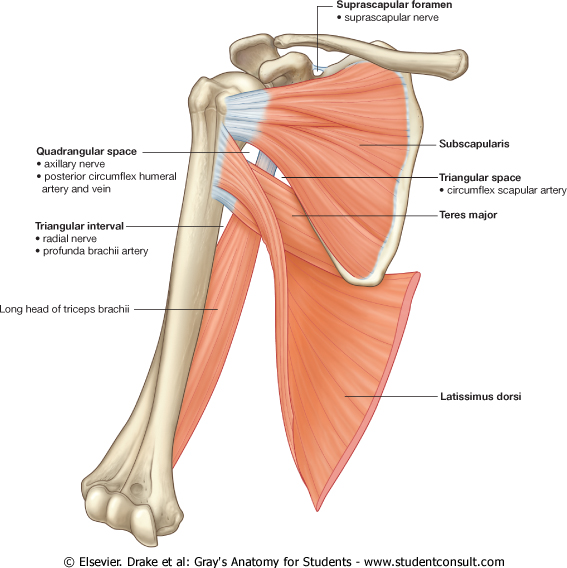 It passes posterior to the medial epicondyle of the humerus and then into the anterior compartment of the forearm. Radial nerve injury in the arm:-The radial nerve is tightly bound with the profunda brachii artery between the medial and lateral heads of the triceps brachii muscle in the radial groove. If the humerus is fractured the radial nerve may become stretched or transected in this region leading to permanent damage and loss of function. This injury is typical (Fig. 7.69) and the nerve should always be tested when a fracture of the midshaft of the humerus is suspected. The patient typically presents with wrist drop (due to denervation of the extensor muscles) and sensory changes over the dorsum of the hand. In the arm and forearm the median nerve is usually not injured by trauma because of its relatively deep position. The commonest neurologic problem associated with the median nerve is compression beneath the flexor retinaculum at the wrist (carpal tunnel syndrome). radial nerve or from the proximal part of the posterior interosseous nerve, but almost invariably above the arcade of Frohse. Arcade of Frohse, sometimes called the supinator arch is the most superior part of the superficial layer of the supinator muscle, and is a fibrous arch over the posterior interosseous nerve. The arcade of Frohse is the most frequent site of posterior interosseous nerve entrapment, and is believed to play a role in causing progressive paralysis of the posterior interosseous nerve, both with and without injury. The deep branch of radial nerve may be damaged during an operation for exposure of the head of the radius.Since the extensor carpi radialis longus and brevis are spared wrist drop does not occur. RADIAL NERVE (see above diagram) :-The radial nerve descends behind the third part of the axillary artery and the upper part of the brachial artery, anterior to subscapularis and the tendons of latissimus dorsi and teres major. With the profunda brachii artery it inclines dorsally, passing through the triangular space below the lower border of teres major, between the long head of triceps and the humerus. Here it supplies the long head of triceps, and gives rise to the posterior cutaneous nerve of the arm (not forearm)which supplies the skin along the posterior surface of the upper arm. It then spirals obliquely across the back of the humerus, lying posterior to the uppermost fibres of the medial head of triceps which separate the nerve from the bone in the first part of the spiral groove. Here it gives off a muscular branch to the lateral head of triceps and a branch which passes through the medial head of triceps to anconeus. On reaching the lateral side of the humerus it pierces the lateral intermuscular septum to enter the anterior compartment; it then descends deep in a furrow between brachialis and proximally brachioradialis, then more distally extensor carpi radialis longus. Anterior to the lateral epicondyle it divides into superficial and deep terminal rami. The branches of the radial nerve in the upper arm are: muscular, cutaneous, articular and superficial terminal and posterior interosseous. Muscular branches :-Muscular branches supply triceps, anconeus, brachioradialis, extensor carpi radialis longus and brachialis in medial, posterior and lateral groups. 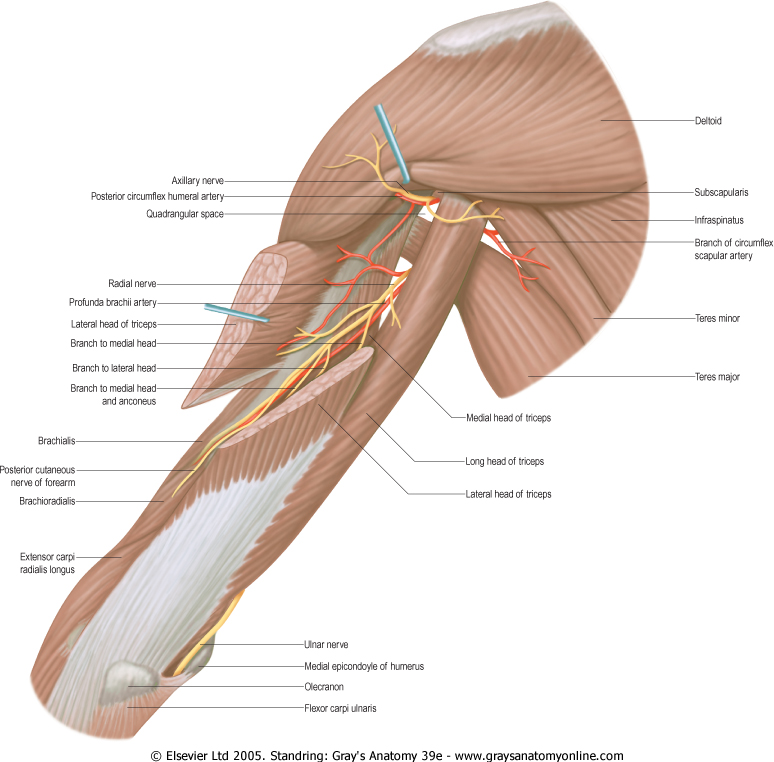 Medial muscular branches arise from the radial nerve on the medial side of the arm. They supply the medial and long heads of triceps; the branch to the medial head is a long, slender filament which, lying close to the ulnar nerve as far as the distal third of the arm, is often termed the ulnar collateral nerve. 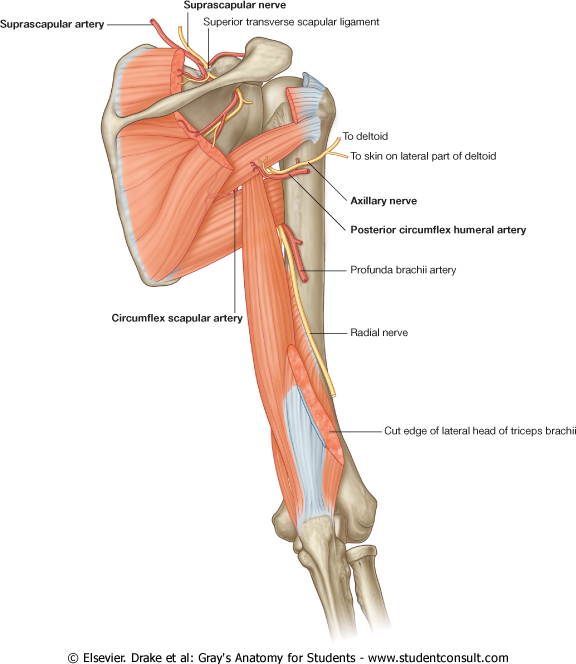 A large posterior muscular branch arises from the nerve as it lies in the humeral groove. 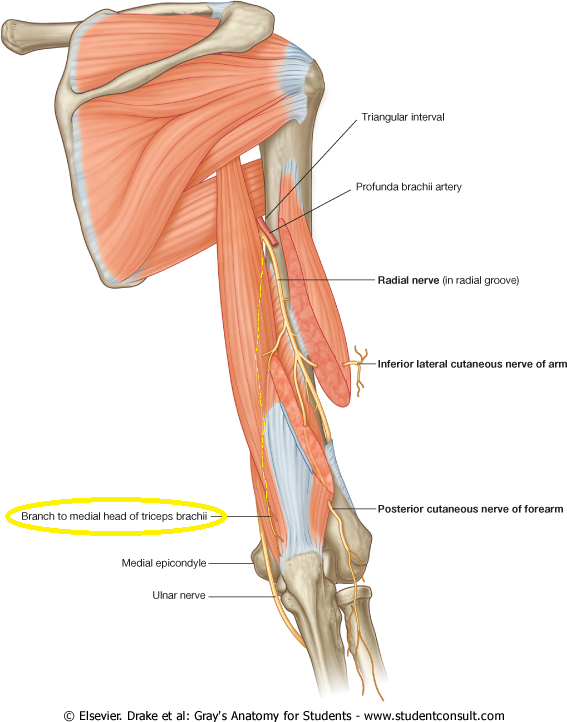 It divides to supply the medial and lateral heads of triceps and anconeus, that for the latter being a long nerve which descends in the medial head of triceps and partially supplies it; it is accompanied by the middle collateral branch of the profunda brachii artery and passes behind the elbow joint to end in anconeus. Lateral muscular branches arise in front of the lateral intermuscular septum; they supply the lateral part of brachialis, brachioradialis and extensor carpi radialis longus. 15. 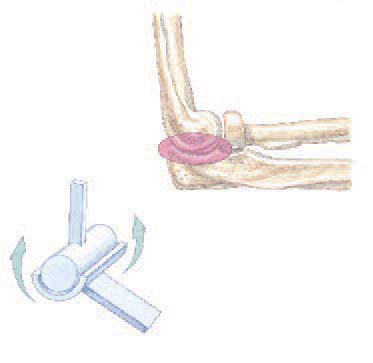 Pronator teres in addition to the main pronator of forearm also causes flexion at elbow joint. 16.”D”eep muscles of the front of forearm (Flexor digitorum Profundus & Flexor pollicis longus) acts on the “D”istal IP joint. 17. Flexor digitorum superficialis acts on the Proximal IP joint. 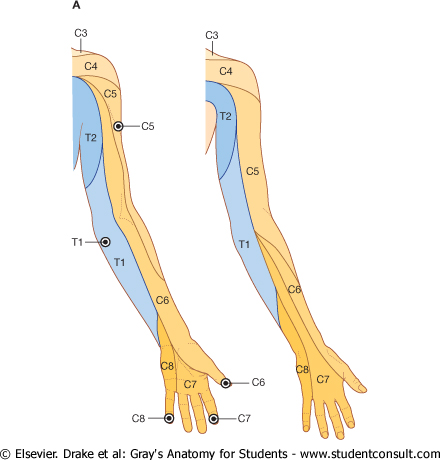 18.Flexor “carpi” radialis:- Flexes the wrist and abductor of the wrist.RADIALIS(RADIUS)=LATERAL..so acts laterally.Carpi—so acts on wrist. Palmaris Longus:- Absent in 10% of subjects. Flexor carpi ulnaris:-Flexes and adduct the wrist.Ulnaris—so adduct.Carpi –so flexes the wrist. 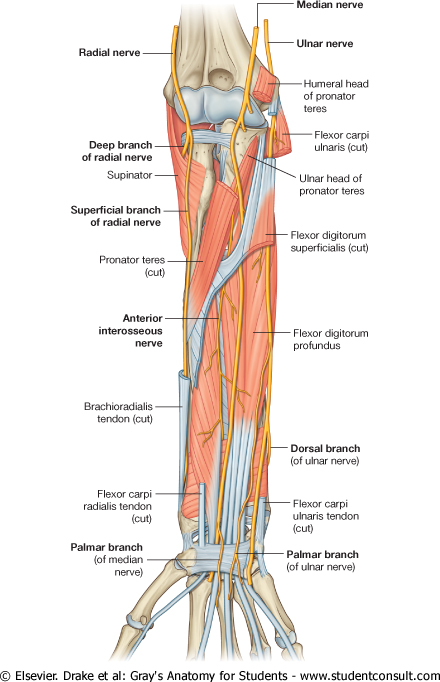 All muscles except the flexor carpi ulnaris in the forearm are supplied by the median nerve. The pisiform bone is a seasmoid bone in the tendon of Flexor carpi ulnaris. 20. Ape thumb Deformity:- Injury of median nerve at wrist leads to wasting of thenar muscles and the thumb is adducted and laterally rotated. :- ABDUCTION IS LOST,OPPOSITION IS LOST,FLEXION IS LOST.Ape hand deformity is a deformity in humans who cannot move the thumb outside of the plane of the palm. It is caused by inability to oppose the thumb and the limited abduction of the thumb. Flexion and extension should be confined to motion at the interphalangeal or metacarpophalangeal joints (Fig. 53.49A-C). Palmar abduction (Fig. 53.49D, E), in which the first metacarpal moves away from the second at right angles to the plane of the palm, and radial abduction (Fig. 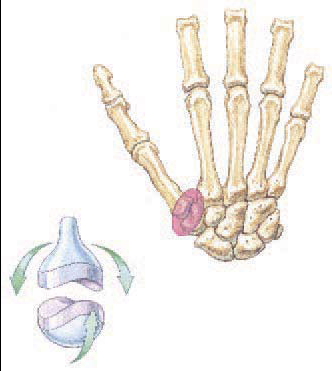 53.49D, F), in which the first metacarpal moves away from the second with the thumb in the plane of the palm, occur at the carpometacarpal joint. The opposite of radial abduction is ulnar adduction, or transpalmar adduction, in which the thumb crosses the palm towards its ulnar border. In clinical practice the term adduction is generally used without qualification. 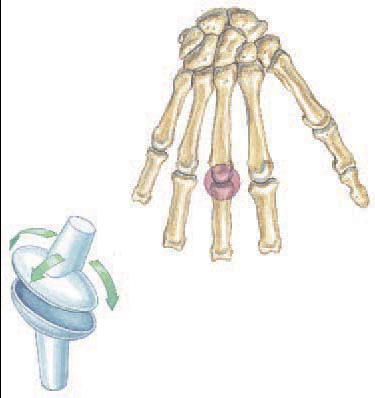 Circumduction describes the angular motion of the first metacarpal, solely at the carpometacarpal joint, from a position of maximal radial abduction in the plane of the palm towards the ulnar border of the hand, maintaining the widest possible angle between the first and second metacarpals (Fig. 53.49G). Lateral inclinations of the first phalanx maximize the extent of excursion of the circumduction arc. 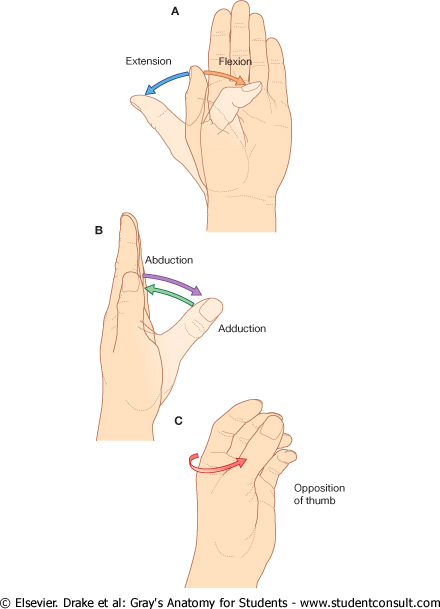 Opposition is a composite position of the thumb achieved by circumduction of the first metacarpal, internal rotation of the thumb ray and maximal extension of the metacarpophalangeal and interphalangeal joints (Fig. 53.49H). 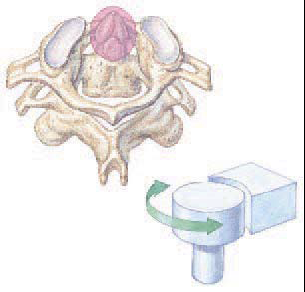 Retroposition is the opposite to opposition (Fig. 53.49I). Flexion adduction is the position of maximal transpalmar adduction of the first metacarpal: the metacarpophalangeal and interphalangeal joints are flexed and the thumb is in contact with the palm (Fig. 53.49J). 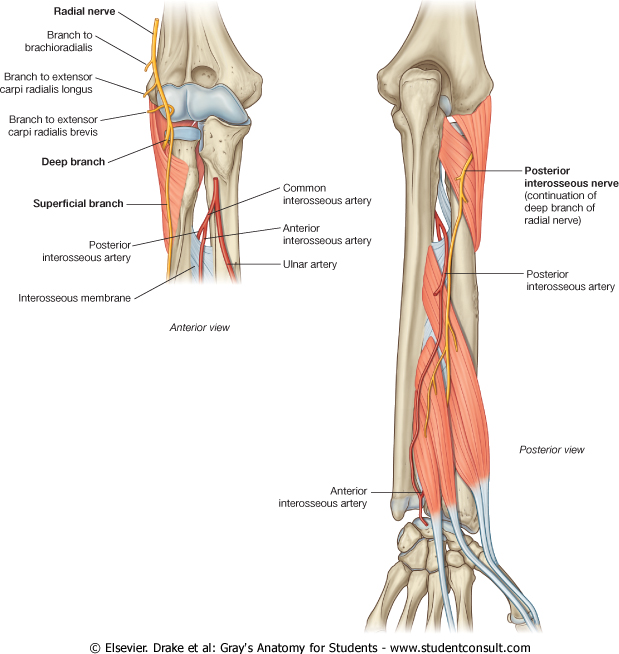 The largest branch of the median nerve in the forearm is the anterior interosseous nerve, which originates between the two heads of pronator teres, passes distally down the forearm with the anterior interosseous artery, innervates the muscles in the deep layer (flexor pollicis longus, the lateral half of flexor digitorum profundus, and pronator quadratus) and terminates as articular branches to joints of the distal forearm and wrist. 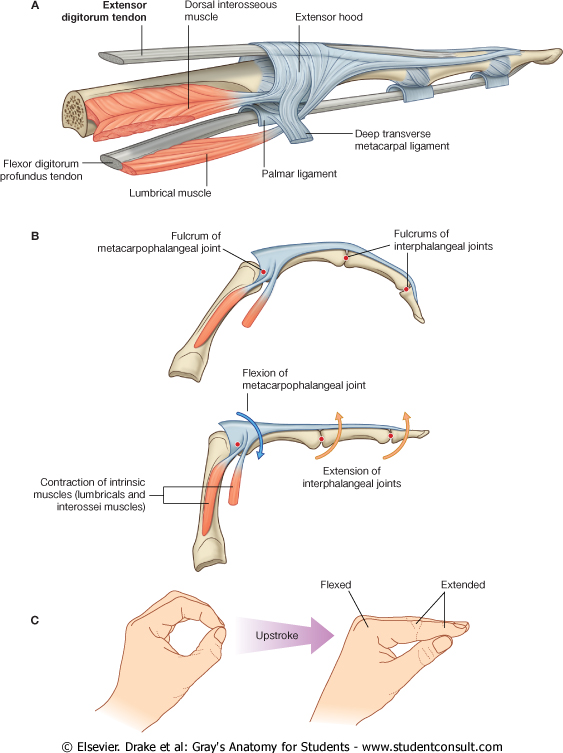 A small palmar branch originates from the median nerve in the distal forearm immediately proximal to the flexor retinaculum , passes superficially into the hand and innervates the skin over the base and central palm. This palmar branch is spared in carpal tunnel syndrome because it passes into the hand superficial to the flexor retinaculum of the wrist. Since the terminal phalanges of little and ring fingers are supplied by ulnar nerve(Ulnar nerve supplies the medial half of digital profundus muscle) These Fingers DIP are spared in Median nerve injury. Also the PIP joint of thumb is spared as flexor pollicis brevis deep supplied by ulnar nerve. There is one IP joint in the thumb and MCP joint.Flexor pollicis brevis causes flexion at MCP jt. and Flexor pollicis longus causes flexion at IP joint of thumb.Both supplied by Median nerve. Flexor pollicis brevis :The flexor pollicis brevis muscle is distal to abductor pollicis brevis.It originates mainly from the tubercle of the trapezium and adjacent flexor retinaculum, but it may also have deeper attachments to other carpal bones and associated ligaments. It inserts into the lateral side of the base of the proximal phalanx of the thumb. The tendon often contains a sesamoid bone(DNB 2010).Flexor pollicis brevis flexes the metacarpophalangeal joint of the thumb. 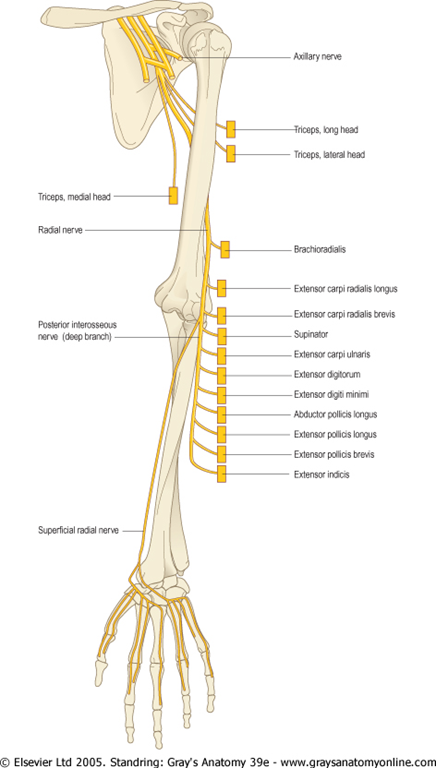 The tendons of the extensor digitorum and extensor pollicis longus muscles pass onto the dorsal aspect of the digits and expand over the proximal phalanges to form complex ‘extensor hoods‘ or ‘dorsal digital expansions‘ . Because force from the small intrinsic muscles of the hand is applied to the extensor hood distal to the fulcrum of the metacarpophalangeal joints, the muscles flex these joints .Simultaneously, the force is transferred dorsally through the hood to extend the interphalangeal joints. 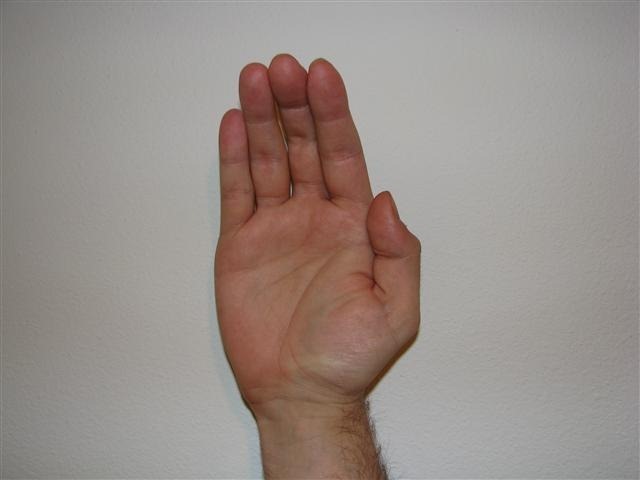 This ability to flex the metacarpophalangeal joints, while at the same time extending the interphalangeal joints, is entirely due to the intrinsic muscles of the hand working through the extensor hoods. This type of precision movement is used in the ‘upstroke’ when writing a ‘t’. In the index, middle, ring, and little fingers, the lumbrical, interossei, and abductor digiti minimi muscles attach to the extensor hoods. 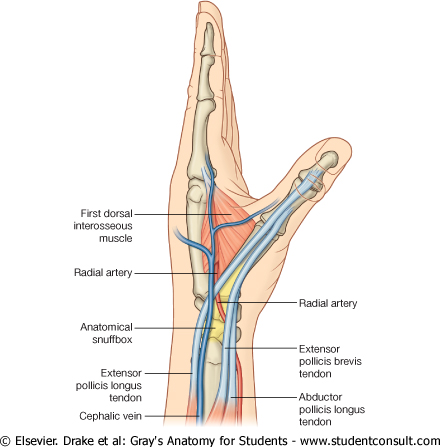 In the thumb, the adductor pollicis and abductor pollicis brevis muscles insert into and anchor the extensor hood. 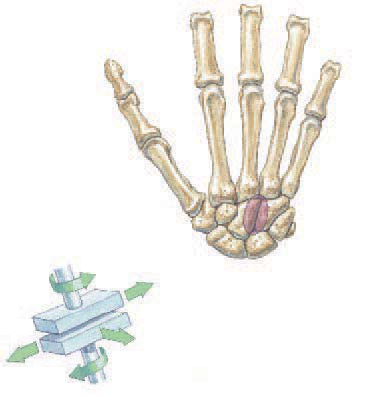 Q:-The lumbricals muscles extend the MCP joints and extend the IP joints of the digit in which they insert. (D)Floor is formed by Extensor carpi radialis longus and brevis.?? the floor of the impression is formed by the scaphoid and trapezium, and distal ends of the tendons of the extensor carpi radialis longus and extensor carpi radialis brevis. 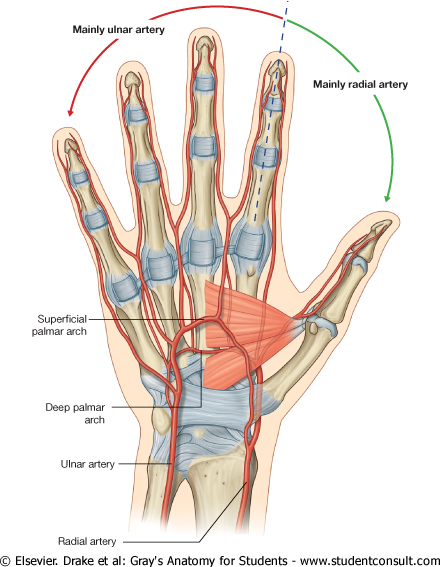 The radial artery passes obliquely through the anatomical snuffbox, deep to the extensor tendons of the thumb and lies adjacent to the scaphoid and trapezium. Terminal parts of the superficial branch of the radial nerve pass subcutaneously over the snuffbox as does the origin of the cephalic vein from the dorsal venous arch of the hand. 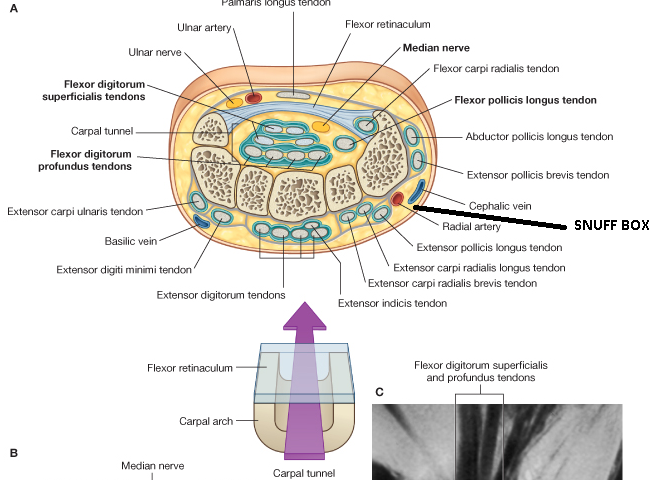 The tendon of extensor pollicis longus can be palpated at the ulnar border of the anatomical snuff-box when the thumb is extended at the interphalangeal joint against resistance. MOST IMP POINT:- ABDUCTOR POLLICIS LONGUS LIES IN THE POST COPARTMENT OF FOREARM/WRIST. 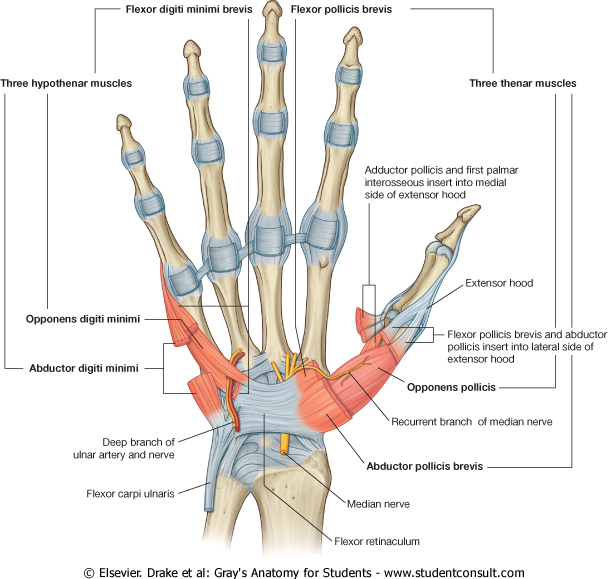 ABDUCTOR POLLICIS BREVIS IS A THENAR MUSCLE. SO NERVE SUPPLY OF FORMER IS RADIAL NERVE WHILE NERVE SUPPLY OF LATER IS MEDIAN NERVE. The structures passing superficial to the flexor retinaculum are:- a)the tendon of the palmaris longus b)the palmar cutaneous branch of the median nerve c)the palmar cutaneous branch of the ulnar nerve d)the ulnar vessels e) the ulnar nerve. 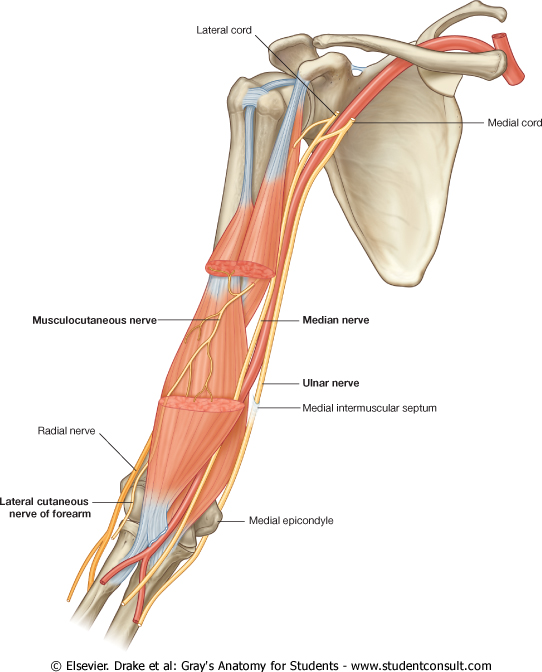 The ulnar artery, ulnar nerve, and tendon of palmaris longus pass into the hand anterior to the flexor retinaculum and therefore do not pass through the carpal tunnel . All the tendons of the flexor digitorum profundus and flexor digitorum superficialis are surrounded by a single synovial sheath; a separate sheath surrounds the tendon of the flexor pollicis longus. The median nerve is anterior to the tendons in the carpal tunnel. The tendon of flexor carpi radialis is surrounded by a synovial sheath and passes through a tubular compartment formed by the attachment of the lateral aspect of the flexor retinaculum to the margins of a groove on the medial side of the tubercle of trapezium.It lies between the retinaculum and its deep slip,in the grrove on the trapezium. 25. Ofcourse the lumbricals do not insert into the thumb as polllicis has its own separate thenar muscles. So 1st lumbricals insert into 2nd MCP joint and so-on so that the 4th lumbrical inserted into the 5th MCP joint.. So 1st lumbicals acts on the index finger but not the thumb or 1st MCP joint,,,imp.They arise from the tendon of the Flexor digitorum profundus (as FLEX DIGITORUM PROFUNDUS is obviously inserted into the 2nd to 5th digits)and inserted into the DDE(dorsal digital expansion of Extensor digitorum. 27. All Interossei and lumbricals Flex the MCP and Extend the IP joint. 28.Midpalmar Space:-Laterally by the intermediate palmar septum attaching the palmar aponeurosis to the third metacarpal bone. Medially by the the medial palmar septum. The radial artery curves around the lateral side of the wrist, passes over the floor of the anatomical snuffbox and into the deep plane of the palm by penetrating anteriorly through the back of the hand . It passes between the two heads of the first dorsal interosseous muscle and then between the two heads of the adductor pollicis to access the deep plane of the palm and form the deep palmar arch. The deep palmar arch passes medially through the palm between the metacarpal bones and the long flexor tendons of the digits. On the medial side of the palm, it communicates with the deep palmar branch of the ulnar artery . 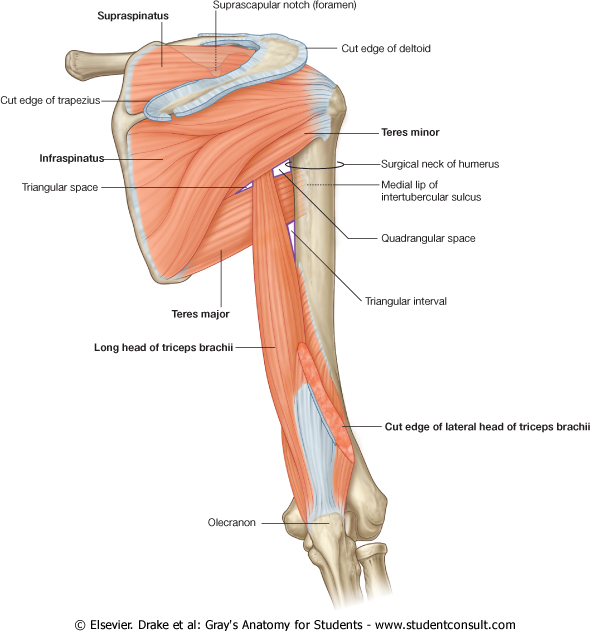 Anconeus is a small, triangular muscle posterior to the elbow joint and is partially blended with triceps (Figs 52.15, 52.17). 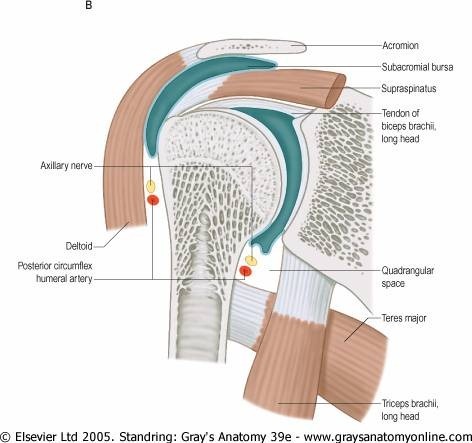 Anconeus arises by a separate tendon from the posterior surface of the lateral epicondyle of the humerus. Its fibres diverge medially towards the ulna, covering the posterior aspect of the annular ligament, and are attached to the lateral aspect of the olecranon and proximal quarter of the posterior surface of the shaft of the ulna. Anconeus assists triceps in extending the elbow joint. Its major function is not clear, but it may be the control of ulnar abduction in pronation, which is necessary if the forearm is to turn over the hand without translating it medially. 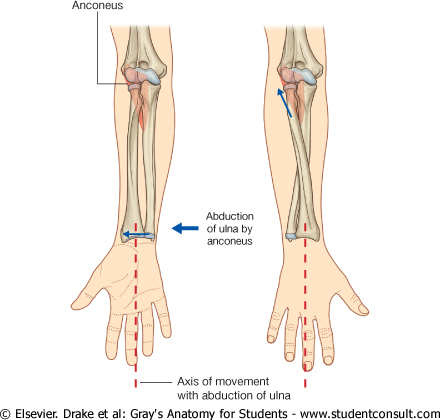 In this way a tool can be revolved ‘on the spot’ or it can be swept through an arc.Anconeus abducts the ulna during pronation to maintain the center of the palm over the same point when the hand is flipped. (D)”Cartilage usually divides the joint into two cavities”FALSE-ARTICULAR DISC DIVIDES. 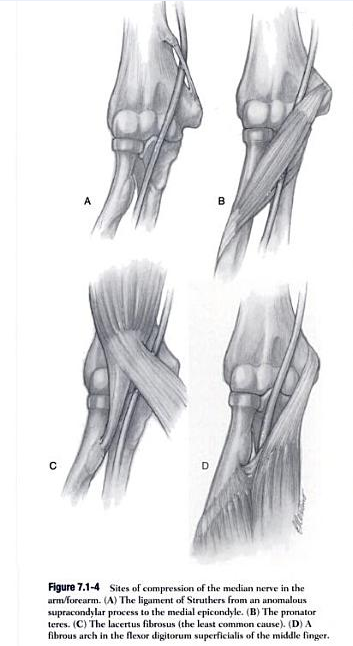 A and B are purely diagrammatic and not related to particular joints. C, however, is a simplified representation of some features of an elbow joint but the complicated contours due to the olecranon, coronoid and radial fossae and profiles of articular fat pads present in a true section have been omitted. Articular surfaces are mostly formed by a special variety of hyaline cartilage, reflecting their preformation as parts of cartilaginous models in embryonic life. Exceptionally, surfaces of the sternoclavicular and acromioclavicular joints and both temporomandibular surfaces are covered by dense fibrous tissue which contains isolated groups of chondrocytes and little surrounding matrix – a legacy of their formation by intramembranous ossification. Articular cartilage has a wear-resistant, low-frictional, lubricated surface, which is slightly compressible and elastic and is thus ideally constructed for easy movement over a similar surface. It is also able to absorb large forces of compression and shear generated by gravity and muscular power. 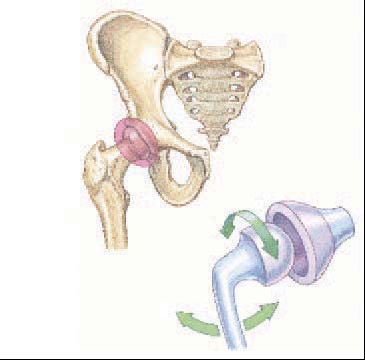 A fibrous capsule completely encloses a joint except where it is interrupted by synovial protrusions; the exceptions are described with the individual joints. The capsule is composed of parallel but interlacing bundles of white collagen fibres which form a cuff whose ends are attached continuously round the articular ends of the bones concerned. Ellipsoid joints:- Ellipsoid joints are biaxial, and consist of an oval, convex surface apposed to an elliptical concavity, e.g. radiocarpal and metacarpophalangeal joints. Primary movements are about two orthogonal axes, e.g. flexion-extension, abduction-adduction, which may be combined as circumduction; rotation around the third axis is largely prevented by general articular shape. Ginglymi (hinge) joints:- Ginglymi resemble hinges and restrict movement to one plane, i.e. they are uniaxial. They have strong collateral ligaments to aid this, e.g. interphalangeal and humero-ulnar joints. The surfaces of such biological hinges differ from regular mechanical cylinders in that their profiles are not arcs but varyingly spiral, and therefore motion is not truly about a single axis. This entry was posted on December 19, 2010 at 3:38 pm	and is filed under Medical. Tagged: AIPGMEE MCQs, All india MD/MS entrance exams MCQs, Multiple choice questions, pg mcqs. You can follow any responses to this entry through the RSS 2.0 feed. You can leave a response, or trackback from your own site. dis is awesome dr. kamaldeep sir. thnx fr ur efforts. it wil really help 2 revise in last few days. thnx again………..
problems. Whenever I take a look at your web site in Safari, it looks fine however, when opening in I.
E., it has some overlapping issues. I merely wanted to give you a quick heads up! Whoa, amazing website formatting! The best way extensive have you ever been blogging pertaining to? you are making blog start looking simple. An entire glimpse of the website is fantastic, let alone this article material! dat iedereen kan deel van uitmaken en hun aanpak tot succes maken. In werkelijkheid kun je zelfs met een schoen string begroting. Recht hier, kunt u een van de grootste internet affiliate marketing programma’s in de industrie. zijn specialisten om te vinden van potentiÃ«le klanten op uw affiliateprogramma.